Fans of the wolf wanted a dog that shared its majestic beauty and could live as a friendly companion. In the late 1980s, this became successful through the development of the Northern Inuit Dog. Since this mixed breed is still fairly new, few are aware of its existence. So I’ve put together some information for us to get to know them better. Can’t Wait to Get a Northern Inuit Dog? Select dogs from Canada were brought into the UK (Greenland) to take part in the development of the Northern Inuit. 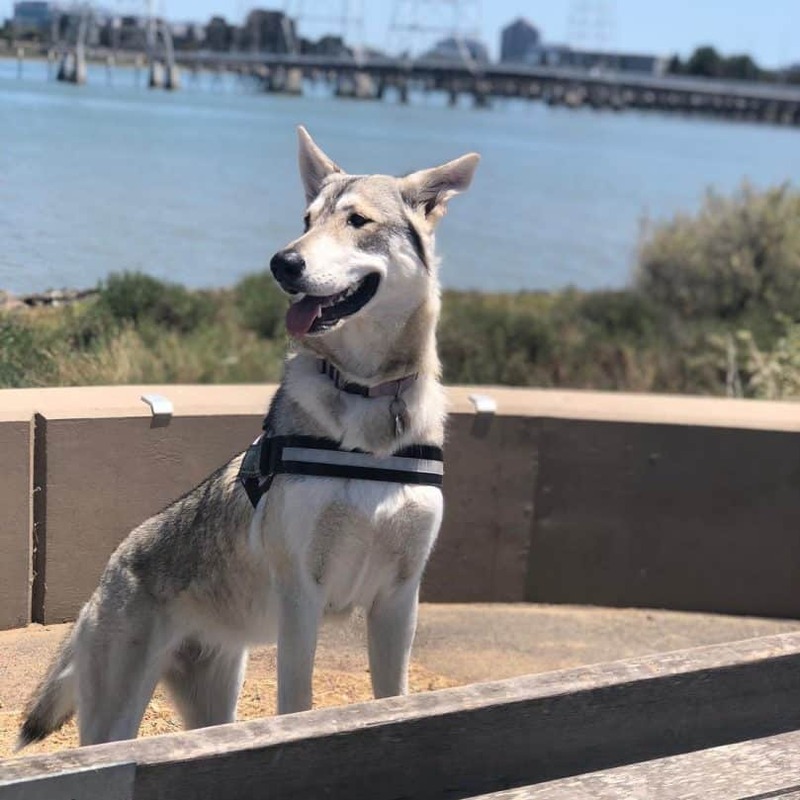 The hybrid originates from crosses of the German Shepherd, Siberian Huskies, Samoyed, a variety of Inuit breeds, the Labrador Husky, Canadian Eskimo Dog, and the Alaskan Malamute. There is no wolf content in the Northern Inuit. Julie Kelham, the founding breeder of the Northern Inuit is shown in the photo below. 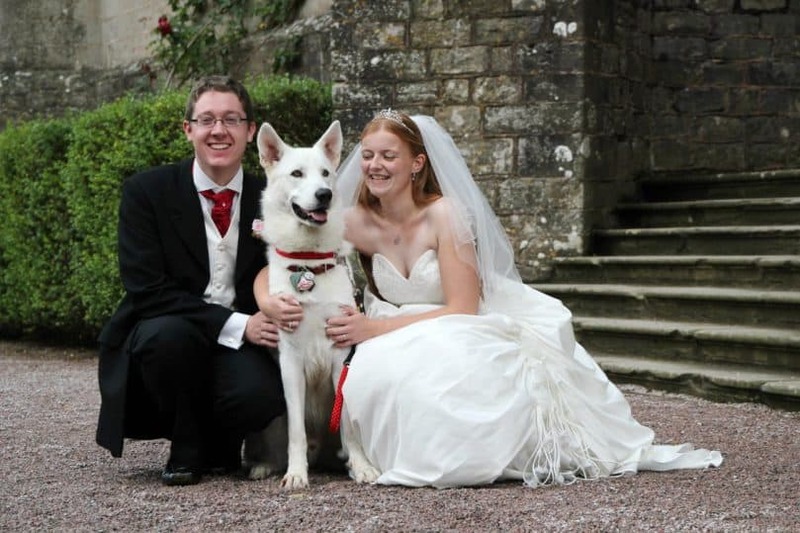 She shared her wedding day with Kyle, the original stud dog, by her side. This hybrid is only recognized by its own independent registry. Developed in the 1990s, this club is known as the Northern Inuit Society. It governs the breeding program and holds the complete pedigree database. Their coat is dense, slightly coarse, waterproof, and double layered. The tail is bushy, and the fur can come in a variety of colors which include: black, gray, sable, white, and apricot. The ears should be erect. You’ll find them to be calm and gentle. They love their family and are a friendly breed that does not show aggression. As an intelligent dog, you can depend on them. But the Inuit can be stubborn at times. They need attention and are prone to suffering from separation anxiety if they are left for too long. This can lead to destructive behavior. Having another pet as a companion dog is a good way to prevent this. This breed is for experienced dog owners only, capable of being the pack leader. Start training at an early age to teach your dog what is expected of him. To prevent boredom, and impatience with training, you should keep him stimulated. Make lessons fun, interesting, and varied. The Inuit has a high prey drive. Which, along with their great sense of smell, can cause the urge to chase and hunt animals. This should be addressed through training. If livestock is present, your Northern Inuit dog must be introduced and socialized with them early. Their inquisitive demeanor and friendly temperament make them very bad guard dogs. They are more prone to making friends with new visitors, rather than alerting you of an intruder. Consider yourself lucky if they bark to warn you of someone approaching. Howling might be heard more often. An obedient Northern Inuit can be a therapy dog. Their teeth should be brushed at least once a week and nails trimmed as needed. Your Inuit will do quite a bit of self-grooming, resulting in the rare need for a bath. They are moderate shedders, and not hypoallergenic. Their weather-resistant fur needs to be brushed 2 to 3 times a week with a slicker brush and a deshedder. Check out this video to see how much they shed! They’re a very active breed and need a significant amount of daily exercise and space. It’s recommended that you provide one long walk (or 2 short ones) per day. If you enjoy recreational running or hiking, your Northern Inuit would love to tag along. Daily playtime should also be provided. They would be content and happy to be outdoors with you all day. Trying new activities such as participating in sports like agility, scootering, and canicross running, will help satisfy the inquisitive and intelligent mind of you Northern Inuit. Your Northern Inuit may suffer from a sensitive stomach. Feeding a balanced raw diet or good quality, high protein kibble is best. Provide him with a food formulated for large-breed, active dogs. The proper daily serving size is 4 cups of food per day. 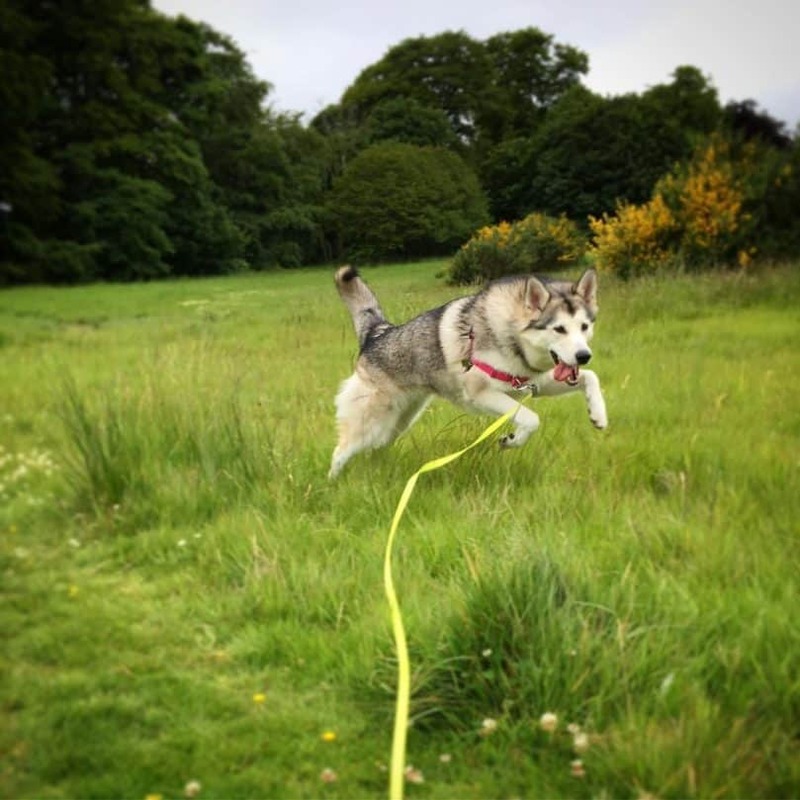 The Northern Inuit Society (NIS) keeps records of all health issues affecting the breed. They monitor this closely, and their code of ethics requires dogs to pass testing for certain diseases before being cleared for the breeding program. All large breed dogs are prone to developing hip and elbow dysplasia. The Northern Inuits is not different. Feeding your large breed puppy an appropriate diet will ensure a proper growth rate and avoid any weight issues. Due to the speed at which they develop, puppies should not be over exercised, or participate in sports that put pressure on their joints. Refer to the chart below to ensure your puppy is growing healthy and on the right track. A few cases of Glaucoma and other eye issues have been reported. Some of which could have been environmentally caused rather than an inherited trait. The Dachshund is an example of a dog with chondrodysplasia, the disease which results in dwarfism. The parents of the eight puppies that were reported to be born like this have been released from the breeding program. Males of this hybrid breed are prone to having cryptorchidism, or retained testicles. No test exists which can determine whether this will occur or not. Generally speaking, if the testes haven’t dropped by the age of six months, then they likely won’t. Degenerative Myelopathy is a non-painful disease involving the spinal cord. It’s generally detected between the age of 8 – 14. First signs can be the loss of coordination in the back limbs. You may notice a wobble as they walk, paw knuckling or dragging of the feet. As DM progresses, the limbs become weaker, the dog starts to buckle and has a hard time standing. Eventually, the Inuit won’t be able to walk and may become paralyzed. This usually occurs within six months to 1 year from the onset of the disease. A few of cases of epilepsy, Addison’s disease and cancer have been reported. In 2011, HBO’s Game of Thrones first aired on television. Northern Inuits were selected to play both the puppy and the young Direwolves in Season 1. In 2016, Wayne Dixon and his Northern Inuit dog Koda (Machine), embarked on a 7000-mile journey. They walked the UK coast picking up litter, generating a large amount of interest from the media along the way. Until 2014 Northern Inuits were only bred in the U.K. Now puppies are being exported all over the world. As the popularity of this breed has grown, so has the number of unethical breeders. So to ensure that you are looking at a genuine Northern Inuit, you should buy only from a NIS registered breeder. Reputable United States breeders include Mountain Myst Northern Inuits and Timberline Northern Inuits in Colorado. Cascade Northern Inuits is located in Oregon. Due to the small number of breeders and the demand for these dogs, you’ll likely need to be placed on a waiting list. Expect the cost of a new Northern Inuit puppy to be between $800 – $1,000 USD. If you prefer adopting, the NIS has a rescue set up. 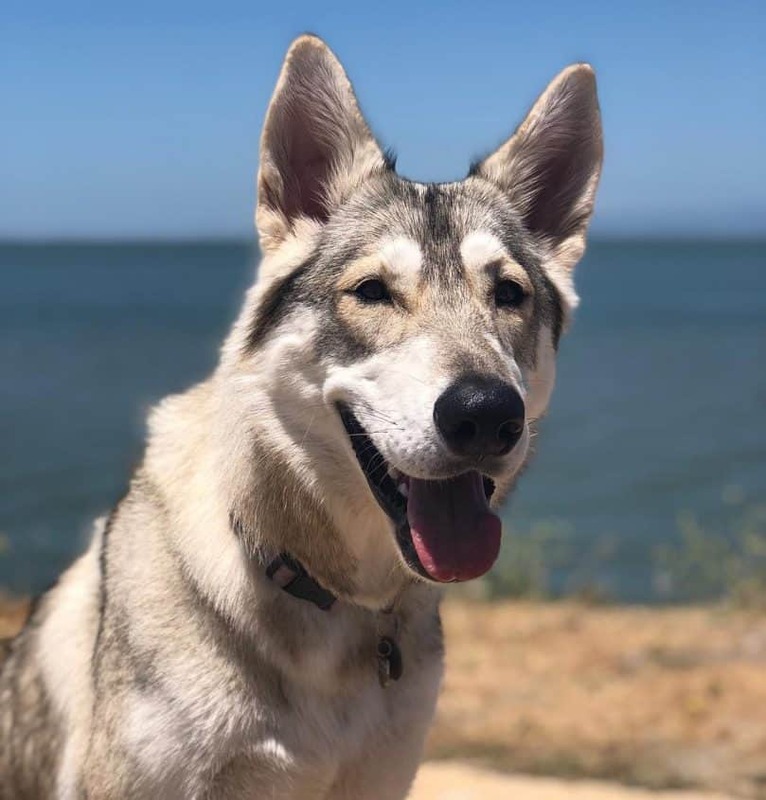 Another option is Lake Tahoe Wolf Rescue – Shelter dedicated to rehoming “wolfdogs,” which often has Inuit Dogs up for adoption. So we’ve learned that these dogs, though they look like wild wolves, are very sweet and loveable. I think this would be a great pet for those that fancy the wolf. Keep in mind though, that, due to their intelligent and stubborn nature, this breed is not for everyone, and should only be owned by experienced dog owners who can provide proper training. Also, they are heavy shedders, meaning your home will be filled with fur. Are you up for the challenge? Leave us your comment below.